Take a jog or a stroll with baby in InStep Safari Jogging Strollers. Made for active parents, InStep swivel wheel joggers provide features that keep the little one comfortable and safe, such as pneumatic tires that ensure a smooth ride and a retractable canopy to protect against UV rays. Two trays with cup holders provide added convenience. 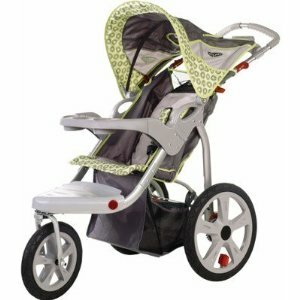 You’ll love going for a jog or taking a stroll with one of these InStep Safari Jogging Strollers. The Instep Safari Swivel Wheel Single Jogging Stroller features 12-inch front and 16-inch rear pneumatic tires with molded rims for durability and performance. A dual trigger folding mechanism offers uncompromising safety while the rubberized handle grip ensures slip-resistant comfort. Other features include a molded parent tray with two cup holders plus a pivoting and molded child tray, also with two cup holders This InStep Safari Swivel Wheel Single Jogger is unmatched when it comes to reliability, comfort, ease of use and affordability. Take a jog or a stroll with baby in the InStep Safari Double Jogging Stroller. Made for the active parent, this swivel wheel jogger provides features that keep the little one comfortable such as pneumatic, high performance tires that ensure a smooth ride, a dual trigger folding mechanism and built-in carrying handles for uncompromising safety when folding and transporting the stroller. Parent and pivoting child trays with two cup holders each add convenience and all three wheels come with a quick-release feature that make removal a snap (literally). The canopy is retractable and has five positions to ensure protection against UV rays. This InStep Safari Swivel Wheel Double Jogger seats two children up to 50 pounds each.